Surface Preparation. What's it about? Even if you're a pro in the industry, there may be some things about surface prep you might not know. Here, we take the opportunity to explore the four primary areas of surface prep in a clear, comprehensive explanation of each. While there is much to say about all of these areas, consider this an introduction to the surface prep industry. We've got many years of experience not only as manufacturers of great equipment, but also participating in the field as well. If you want a more thorough explanation about any of these areas and how it might grow your business, give us a call and we'd be happy to help you out. Floor Planers use a rotating cutter drum, to prepare the surface, which can be fitted with alternate cutters and configurations. The cutting tools strike the surface by centrifugal force, removing contamination and texturing the substrate. 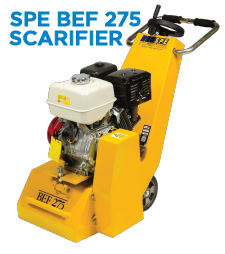 Planers are used to reduce levels, remove old coatings, road marking, and failed screed etc. Tungsten carbide tipped cutters aggressively texture, plane, scabble and groove concrete. Hardened steel beam cutters remove deposits, leaving a finer textured finish. Planing/scarifying is dust free when suited with a suitable dust control vacuum. The wide versatility of attachments, combined with the aggressive action is suitable for many applications. Floor grinder use horizontally rotating discs to prepare the substrate. 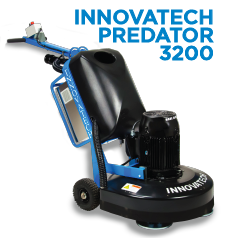 The equipment effectively flattens the surface, leaving a finely textured finish suitable for the application of floor coatings. Suitable applications include the reduction of tamped concrete, high spots, and the re-profiling of old concrete floors. Floor grinders can be fitted with various attachments allowing the removal of old latex screed, adhesive and flexible materials. 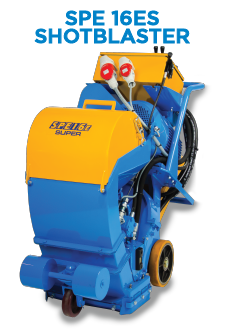 Graded grinding systems are available to grind/polish terrazzo tiled and resin based systems. 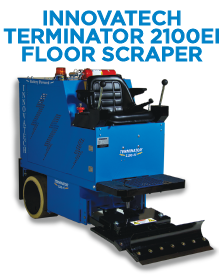 The benefits of floor grinding are that the surface is flattened, and a fine key provided. This can mean that less flooring material is required to fill voids in the floor surface and provide a consistent wearing layer. Totally enclosed shot blasting is quick and dust free, It removes contamination and textures the surface in one process, effectively removing laitance, paint, failed coatings, rubber deposits etc. Shotblasting textures concrete, steel and asphalt surfaces, providing a keyed surface for the applications of follow on materials, by propelling at high velocity steel abrasive which rebounds from the surface and is recycled. The contamination is taken away by the dust collection unit. Both high and low points are equally textured, without fracturing or loosening the aggregate. Stripping machines are used to remove bonded materials from various floor finishes. The equipment uses a flexible steel blade to rapidly strip and remove the old floor coverings. Multistrippers can be used to remove sheet vinyl, linoleum, bonded carpet, tiles, de-bonding membranes and sports surfaces. Electrically powered self propelled versions are generally used for the majority of applications. Ride-on Floor Scrapers are suitable for large projects, providing high production rates. Propane gas and battery are used to power the equipment, depending on the model. This ensures that the equipment is suitable for indoor projects. After the old coating has been removed, the surface should then be prepared using the correct equipment from the selection chart. Want great content straight to your inbox? Join ContractorHQ now!